Ian McMullin’s service to the Collingwood board has been so extensive that it is easy to forget what came before his long term role as one of Eddie McGuire’s loyal lieutenants. Doubtlessly, there is a generation of young Magpie supporters blissfully unaware that this successful businessman was once a fresh-faced half-forward who produced one of the most dynamic second-game performances in the club’s history. Better still, it came in a big finals victory. McMullin was a rising 20-year-old when plucked out of the amateurs, and his performance in kicking five goals in the club’s 1984 elimination final victory over Fitzroy one memorable Sunday afternoon at the MCG proved the high point of his league career. He would play 25 games and kick 29 goals in two separate stints with the Magpies. In between came a career-threatening ankle injury, a few knee issues, a return to amateur ranks, an overseas working holiday to help get his body right again, and a call-up from Kevin Sheedy that brought about another 24 VFL matches with Essendon. In all, he would play nine seasons at the highest level – for a total of 49 games and 55 goals with Collingwood and Essendon – but it was his match-winning performance against the Lions that still stands out. That game showcased the best of McMullin’s game: skills, evasiveness, nose for goals and an intuitive reading of the play that regularly allowed him to get into dangerous positions. He was a classic half-forward flanker who didn’t need many touches to create havoc. At a time when Collingwood had its cheque book open for footballers across Australia, which would ultimately drive the club to the point of bankruptcy a few years later, it got a bargain in McMullin, even if it came after a bit of an old-fashioned arm-wrestle with Melbourne. The Demons were keen on the youngster from Old Melburnians in the Victorian Amateur Football Association, and were prepared to put up a bit of a fight. It would prove a bargain, given not only his time wearing the black and white, but for all that would come afterwards. Still, McMullin’s start to his time at Collingwood was hardly an auspicious one. Six weeks later, McMullin had shown enough form in the reserves to be brought into Collingwood’s senior team for his AFL debut – on the day of his 20th birthday – against Footscray at Victoria Park. He was a late inclusion for Graeme Allan, who withdrew with a virus. In that debut game, he had 13 disposals and kicked a goal in the 43-point win that saw the Magpies finish the home-and-away season in fourth position. He did enough to keep his spot for the cut-throat final against Fitzroy, and would not let senior coach John Cahill down, even if he owned up to a few nerves before the game. Collingwood kicked five goals in the first term, but still trailed Fitzroy by a point. McMullin kicked one of those five opening quarter goals. The half-forward had been given instructions from Cahill allowing him to “go anywhere”. He followed the advice and helped himself to 18 disposals and five goals in total in what was a close game for three quarters before the Magpies came from home with 10 goals in the final term. That powerhouse last quarter turned a four-point three quarter-time lead into a 46-point win. McMullin “weaved, dodged and snapped his way to five goals”, helping to bring a youthful zest to the Magpies’ attack as Cahill’s team looked ahead to a semi-final contest with old rivals Carlton. Three of McMullin’s first four games were finals. He kicked 2.2 in the 25-point win over the Blues, but went goal-less in the 133-point preliminary final thrashing handed out by eventual premiers Essendon. Mind you, the Magpies only kicked five goals (three to Ron Andrews) in that game, and McMullin’s eight touches resulted in 0.3. McMullin played nine games in 1985, with his best performance coming with another bag of five goals in Round 9 against St Kilda. But injuries began to take a toll. He played only seven games in 1986, snapping the ligaments in his ankle in a game and after one senior game the following year, returned to the amateurs. Two knee operations and an ankle reconstruction had seemingly ended his league career. He played in an amateur premiership in 1988, took a year off football when travelling overseas the following year, before Sheedy resurrected his career with Essendon in 1990. He was with the Bombers for three seasons before a training accident – where his vocal chords were damaged – forced his retirement. His last game for Essendon came against Collingwood, of all clubs, in Round 4, 1992. 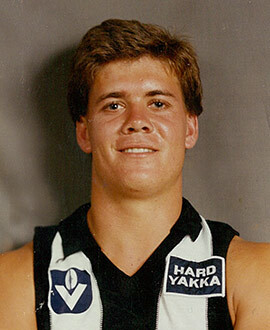 Then the Magpies used the midseason draft –and pick 25 – to give McMullin another chance. He played three games late in the 1992 season in black and white before one final game in the middle of 1993. That proved his last game for Collingwood, but not his last contribution. Only five and a bit years later, he returned to Victoria Park as part of McGuire’s new ticket to help resurrect the club. As part of the Magpies’ board, McMullin played a significant role in guiding the club into the modern, professional era of the AFL, and he was rewarded in 2007 with life membership. McMullin’s footy career had soared spectacularly but only briefly on the field. But his influence off the field would be more far enduring, and every bit as important as that second-up effort that helped win Collingwood a final.